Terminal 1D of the Delhi airport, which will witness a major expansion starting this year end, will see the shifting of only one airline to Terminal 2 to make the construction work easier. Terminal 2 of the Indira Gandhi International Airport, the erstwhile international terminal that has been lying almost defunct since 2010 when Terminal 3 was commissioned, is buzzing with construction at present to cater to airlines that will be shifted from Terminal 1D. The domestic Terminal 1D, which caters to low-cost carriers IndiGo, Go Air and SpiceJet, is bursting at the seams due to exponential growth in air traffic in the past few years. The private airport operator Delhi International Airport Limited (DIAL) plans to expand Terminal 1D to accommodate the growing rush and had decided to shift two budget carriers operating from T1D to T2 to help carry out the construction work. 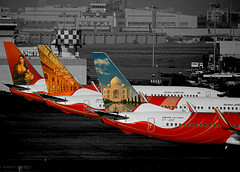 An internal assessment by DIAL, however, has made it do a rethink and only one airline would now be shifted to T2. “We have realised that instead of two, if we just shift one airline, it would be enough to carry out the construction work with ease. It is most likely that operations of SpiceJet would be shifted to Terminal 2,” said a senior airport official. DIAL plans to start operations from T2 from January 1, 2017, and the terminal is undergoing a revamp to accommodate the airline. DIAL also plans to start bus services from the Airport Express Line of Delhi Metro to provide seamless connectivity to passengers. T2 is located at a slight distance from T3, to which the high-speed metro line connects directly. An airport official said that adequate number of signages will be put on the approach roads to guide passengers to the correct terminal. “Terminal 2 was started in 1986 and has been mothballed since 2010 after Terminal 3 was opened for public. To allow flight operations from here again, the terminal is being completely refurbished with new flooring, false ceiling, air-conditioning among others,” an airport official said. “Apart from these changes, the technical systems are also being upgraded and made up-to-date for flight operations,” he said. “Thanks to the shifting of SpiceJet, passengers at Terminal 1D can look forward to more space from early next year,” the airport official said. DIAL has embarked on a major expansion plan for T1D, which will see its size go up from the present 53,000 square metres to 1,33,000 square metres in the next three years. At present, it is expanding the terminal on the airside and it will be able to cater to 18 million passengers per annum. In three years, it is expected to cater to 30 million passengers per annum. Once again, a lovely article, Sir. I look forward to the T1 upgrade, T2 temporary opening, and finally, T4 construction, and more simultaneous runway operation after the new ATC tower comes into place. Last week, GMR led consortium which runs the country’s biggest airport – Delhi international Airport, came up with a detailed plan for the expansion of the airport. This multi-phase plan looks like a culmination of last few years of planning and revisions which have been going on to add runway capacity, air traffic movement and terminal. The group will invest INR 16,000 crore for the expansion which will involve doubling capacity of Terminal 1 (T1), increase capacity of Terminal 3 (T3), add a new runway and build another terminal between now and 2026. The air traffic movement will gradually cross 100 movements per hour, which could mean an addition of 15-20 flights per hour. Eventually the airport will have three terminals – T1, T3 and T4 and all of them could have International and domestic operations together. The airport operator wanted to start International operations from T1 when IndiGo was to launch International operations, however the plan was shot down by various agencies which led to IndiGo and Spicejet operate their international flights from T3. The new plan sees major changes on Terminal, Apron and Runway side. The GMR led consortium bagged the rights to operate and develop the airport in 2006. First came the new runway in 2008, Terminal 3 came up in 2010, well in time for the Commonwealth games later that year. That month, the airport saw a little over 25 lakh passengers, 72% of which were domestic. There were serious thoughts then to shift all carriers to T3 and disband T1 completely. Every planner who resisted this idea and DIAL which revisited the plan must have been very happy that they did not go ahead with this recommendation. May 2017 saw the airport handle 54.3 lakh passengers, 75% of which were domestic, primarily fueled by IndiGo and its phenomenal growth at Delhi. Multiple master plans were drawn out till date which included converting the present day T1 to cargo terminal and building new terminals at area occupying the existing cargo terminal or re-aligning runway 09/27 to make it parallel to the other two and providing a different area to Technical Dispersal of Indian Air Force. As Delhi International Airport Limited (DIAL) went from one hurdle to another, including developing aero city profitably, the plans changed only to come up with a solid plan last year which was eventually approved by all the stakeholders including the ministry. However, this led to another hurdle. Getting the airlines onboard to shift from T1 either completely or partially. With slots allocated based on the terminal due to the constraints like gates and terminal capacity being different and primary runway being used also being different, indecision was surely affecting expansion plans of low cost carriers. Once again, a nice write-up, Sir! I look forward to reading this on your website when it is accessible again. GMR can do any amount of modification of DEL airport complex. But please don’t disturb IGI T3, leave it the way it is now. I would say it is the most comfortable airport I have travelled. I wish to travel through T3 many years to come! Last night Delhi International Airport (DIAL) conducted successful trials of TaxiBot vehicles with involvement of Jet Airways and Spicejet. VT-JGC from Jet Airways and VT-SPF from Spicejet were the two aircraft involved in the trial. Israel Aerospace Industries (IAI) and KSU Aviation Pvt. Ltd. had got into an agreement in July 2018 for operating TaxiBot vehicles in New Delhi and Mumbai. The contract involves operations on a trial basis till end of 2018 in controlled environment and the next phase will involve delivery of 38 additional vehicles in four years to both the airports and additional airports if needed. The narrowbody TaxiBot had arrived in Delhi in the first week of September and are manufactured in France. TaxiBot is a semi-robotic vehicle which connects to the aircraft and is controlled by the pilot to taxi the aircraft from parking stand to the runway with no use of the main engines of the aircraft. This leads to a fuel saving of upto 85% and could make a difference in current times of high fuel regime. It also increases ramp safety and prevents ingestion of foreign objects by the engines on ground, apart from improving the flow of aircraft on the apron. The vehicles designated for New Delhi International Airport were completed at Frankfurt airport with help of Lufthansa LEOS and TLD. TaxiBot completed certification tests in July 2014 and was approved for aircraft towing in November 2014 with LH 140 from Frankfurt to Nuremburg being the first commercial dispatch. TaxiBot are in regular operations at Frankfurt Airport since February 2015. The capital’s Indira Gandhi International Airport (IGIA) is now the world’s 12th busiest airport — moving up four places from the 16th spot in 2017 — by overtaking mega hubs like the Frankfurt, Dallas Forth Worth, Guangzhou and Istanbul Ataturk airports.